is the symbol of freedom, art, and democracy in the conscience of the civilized world. The capital of Greece took its name from the goddess Athena, the goddess of wisdom and knowledge. Ancient ruins provide a vivid testimony to the glory of Athens, hailed by many people as the cradle of western civilization. Sparta a beautiful town near the river Evrotas, located in the centre of the Peloponnese in southern Greece, is the capital of the prefecture of Lakonia. SPARTA ( known in Greek as Sparti) has a history which dates back to the Neolithic period, at least 3, 000 years before Christ. Modern Sparta, founded by the government in 1834, occupies part of the site of ancient Sparta and is the capital of the department of Laconia. Excavations of the ancient city have uncovered ruins of temples and public buildings as well as a theatre dating from the Roman period, but the sparse remains are insignificant for a city of such renown in antiquity. Olympia ancient sanctuary and site of the ancient Olympic Games, located in the western Peloponnese, 10 miles (16 kilometres) inland from the Ionian Sea, near a point where the Alpheus (Alfios) and Cladeus (Kladios) rivers meet. Berzconsulting agentur für praxis marketing. 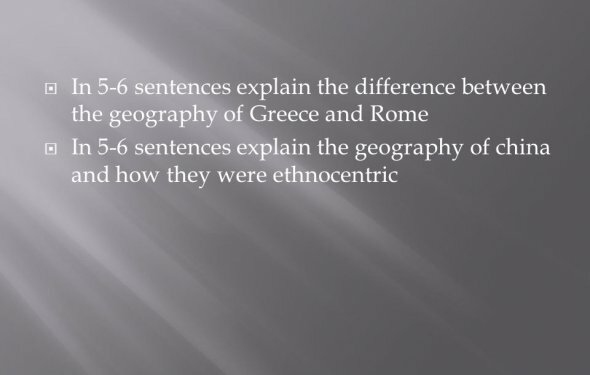 How did geography impact the development of Greece and Rome. The Apennies are less rugged than then the mountain ranges of Greece.